The seven main chakras simple guide is your doorway to understanding these vital power centers. Our world and the universe that we reside in is made up of energy. Energy is what keeps us going. So, where does this personal life force energy come from? The answer to this is that the energy force of life comes directly from the seven chakras which are located within our *Etheric Body. Each of the seven main chakras empowers an aspect of our consciousness. For understanding the chakras, think of them as the flow of energy operating in your life. The energy of the chakras is subtle rather than physical. Those with clairvoyant vision speak of the chakras as vortexes of energy that spin with each radiating its own color. The more energy flowing through the chakras, the faster they spin. The word “Chakra” originates from an ancient Sanskrit word meaning “Wheels of Light.” The wheels are actually spinning vortexes that draw in energy. The chakras, aligned with our spine, are linked to different areas of our body and its functions–from mental to physical to spiritual. Importantly, chakras act as a conduit for the energy to flow through the body. More importantly, they direct energy throughout the entire body. The teachings of the chakras go back to the Hindu yogis in ancient India. They were brought to the western world’s attention in the early 1900s by Madam Helena Blavatsky. Blavatsky spent years in India learning ancient teachings from Tibetan Masters. Since then, metaphysical students and healers have focused heavily on the functions of the chakra system. Once you understand what chakras are and how they influence your overall field of energy, you will have a better understanding of yourself and perhaps how to make simple improvements in your life. The Seven Main Chakras are not only the Wheels of Light but are actually the Wheels of LIFE! Few people choose to study additional chakras beyond the primary seven. Perhaps this is because there are hundreds more contained within our human energy field. The seven main in-body chakras are the ones which have a significant impact on your aura, or energy field, and ultimately your overall health and well-being. Understanding the effects of these seven primary in-body chakras and their purpose, goes a long way for keeping them healthy, open and continuing to circulate the vital life source energy throughout the entire body. 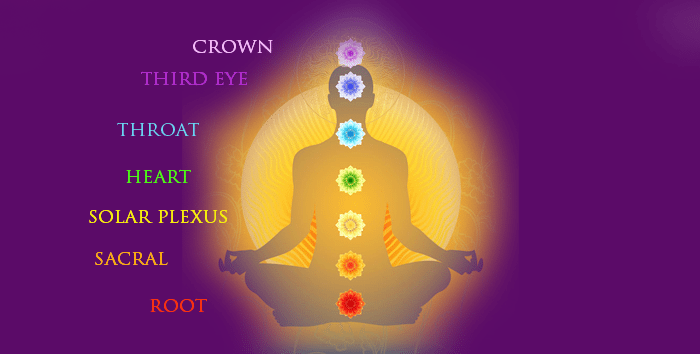 The Seven Main Chakras start with the Root Chakra at the base of the spine to the Crown Chakra at the top of the head. Also called the First Chakra, this chakra is located at the base of the spine. The Root Chakra is associated with the color of vibrant red. Things that stimulate it include gardening, getting plenty of exercise and sleep, and all things red, including food, beverages, clothing, gemstones, and essential oils. Also called the Second Chakra, the Sacral Chakra is located in the lower abdomen and is associated with the color of vibrant orange. Things that stimulate the Sacral Chakra are soothing baths, massages, and all things orange, including food, clothing and essential oils. Also called the Third Chakra, the Solar Plexus Chakra is associated with the color of vibrant yellow and it is located right above the navel. This chakra is stimulated by such things as learning, reading, challenging your mind, spending time in the sunshine, and all things yellow, including food, beverages, clothing, lemons, and gemstones. Also called the Fourth Chakra, the Heart Chakra is located at the center of the chest and is stimulated by having fun with loved ones, all things green, including edibles and clothing, eucalyptus oils, and spending time in nature. The Heart Chakra is associated with the color of vibrant green. Also called the Fifth Chakra, the Throat Chakra is located at the throat just like it sounds. It’s associated with the color of cobalt blue and is stimulated by poetry, singing, good conversation, food and drinks that are blue, blue gemstones and clothing, and the use of blue essential oils. Also called the Sixth Chakra or Anja, the Brow Chakra is located in the middle of the forehead just above the eyes. It’s associated with the color of vibrant deep indigo (a reddish-blue). Additionally, this chakra is referred to as our “third eye”. Also, this chakra is most often linked with clairvoyance abilities. The Sixth Chakra is stimulated by indigo food and beverages, indigo gemstones, gazing at the stars, and a proclivity for indigo essential oils such as lavender. Significantly, the Brow Chakra is the center for our intuitive sensing and feeling. Also called the Seventh Chakra, the Crown Chakra is located at crown, or top of the head area. The color the Seventh Chakra is associated with is a soothing violet. This chakra helps us to focus on spiritual learning, understanding the various levels of consciousness, and connecting to higher dimension. Things which stimulate this chakra include violet oils, violet foods and beverages, setting goals, and dreaming. 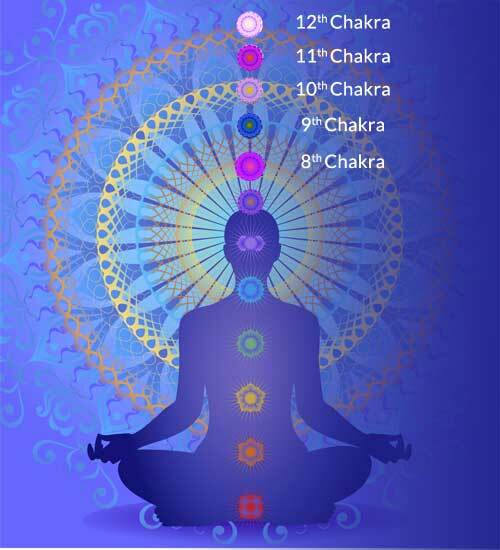 The next set of chakras are called, “the out-of-body-chakras.” The five out-of-body chakras begin with the 8th Chakra. Again, detailed descriptions and functions of these higher chakras are in our Psychic -Clairvoyance Certification training. *The Etheric Body is the next body we all possess after our physical body. The Subtle Body holds an invisible subtle template of our physical body and can never be altered.–regardless of any damage that alters the physical body.